"Mouthwatering Mexican dinner ready in just 20 minutes. Serve these turkey tacos made using Old El Paso® taco seasoning mix and shells." In 10-inch skillet, heat oil over medium-high heat. Cook turkey in oil until no longer pink; drain. Stir in taco seasoning mix and water. Reduce heat; simmer uncovered 5 to 10 minutes or until thickened. Spoon filling into taco shells. Add toppings. Ground chicken also works great in this recipe as a substitute for ground turkey. In you have trouble finding fresh pineapple, substitute canned pineapple chunks. 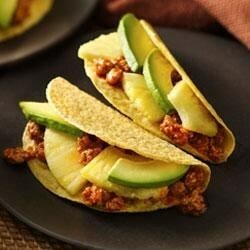 Simply drain the juice and use the fruit to top each taco. First time I used Turkey and this ended up being a hit for my daughter and I. Added the cheese and tamatoes for my daughters taste preference.